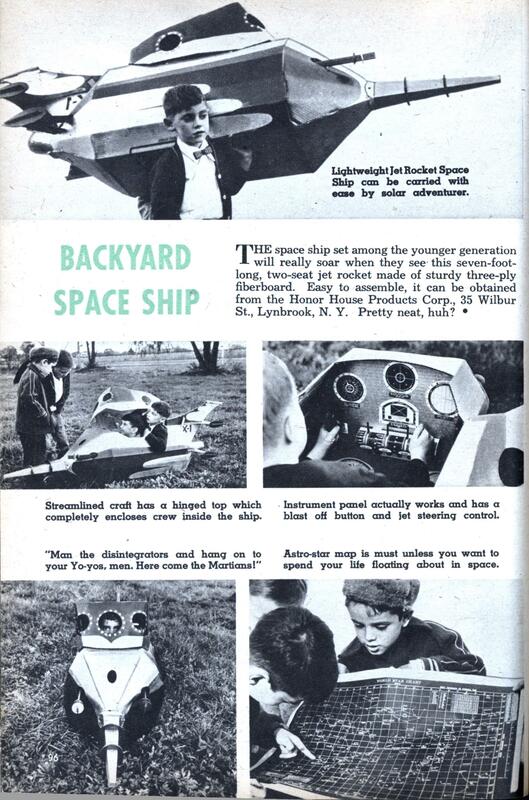 THE space ship set among the younger generation will really soar when they see this seven-foot-long, two-seat jet rocket made of sturdy three-ply fiberboard. Easy to assemble, it can be obtained from the Honor House Products Corp., 35 Wilbur St., Lynbrook, N. Y. Pretty neat, huh? I remember seeing the advertisement for this on the back of many comic books, but this is the first time I discovered that more details were printed somewhere! You can take it to spacc but don’t leave it out in the rain. “sturdy three-ply fiberboard” is marketing-speak for “cardboard box”. Still, the joy in such a thing is in the imagination, and I’m sure some imaginative kids had some wonderful fun in this thing. My own kids have spent many hours playing in much less elaborate cardboard boxes, and I still remember when my childhood friend’s family got a new refrigerator and we got to turn the box into a hideout. I wonder what’s on the instrument panel that “actually works”? 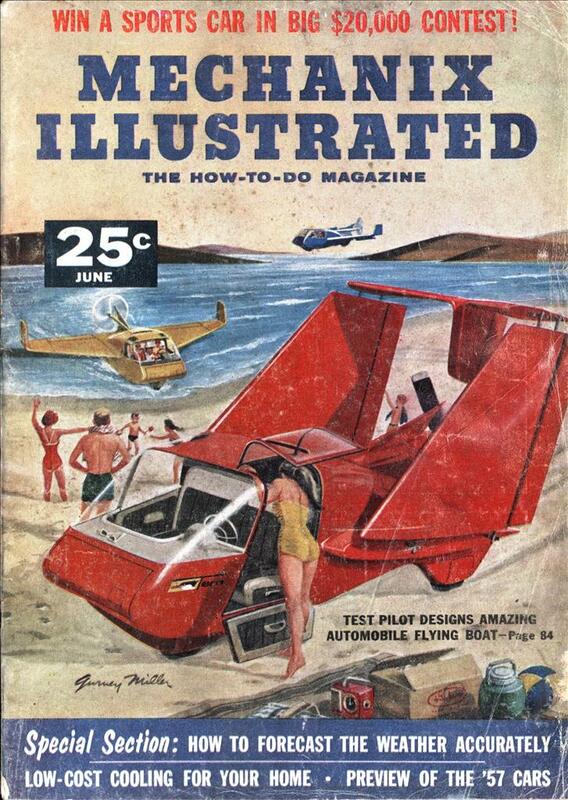 I had one of these as a kid; it was quite a bit of fun for the money. ($4.98…including shipping IIRC) the star map was for navigation and was printed by the Naval Observatory. Controls on the instrument panel were levers made out of Tinker Toys. There was a lit control panel (powered by batteries) as well. The company also made a Polaris submarine and a tank. What I would have given to get one of these….they kept buying me dolls. Or at least until I buried them all in the backyard with appropriate funereal pomp. Charlene: Back in 1967 eight year old me really, really wanted to win the Gemini capsule in this contest. Like hell I was going to donate it to a museum! Charlene: Wait – did you bury the dolls or the people who insisted on giving them to you? It’s a little unclear. Jari: I know, in Charlie’s backyard at the museum. Turbine Hall to be specific. I’ll have to make a point to visit it some time. The dolls. A few weeks later I got to visit a nice man in a white coat, though. Yeah, everybody wanted that Gemini capsule. I wonder if it came with the retro and equipment modules, as shown in the ad? The two linked articles don’t mention the Revell/McDonnell squabble over the replica. Since the replica is described in the ad as 19 feet long, it apparently did have the retro and equipment modules with it when delivered; I wonder what became of them, as the museum only has the crew module on display. Pat Flannery: Well there was a difference between what was represented in the ad and what was delivered. I’m referring to the actual delivery by train instead of the NASA “Flying Guppy” as promised in the ad. I’m guessing now that McDonnel Douglas came through on the capsule but drew the line at fabricating the Equipment Module and Reentry Module portions. If I had won it, and it had to be donated to a museum or school as they required, there would be soon be a cardboard sign over the Flannery family garage with “American Museum Of Unnatural History” written on it with Crayolas.